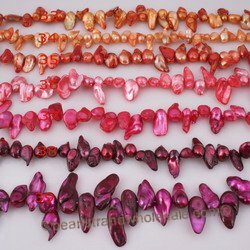 pearlstrandwholesale.com have largest selection of freshwater blister pearl beads in different color,size and quality! Knowledge: A blister pearl (also called a bouton pearl) is a pearl that developed attached to the inside of a mollusk's shell. This type of pearl must be cut off the shell, and is therefore hemispherical.